Evil Never Dies (which until recently was going to be called The Haunting Of Harry Payne, but was changed to a far more generic title in December) tells the story of Harry Payne, an aging mobster who’s just left prison after serving ten years for the murder of his gang boss and best friend. Keen to leave a life of crime behind him, Harry has moved to a small village in Norfolk to become the new landlord of a quiet pub. Naturally, in order to ensure there’s a film worth watching, things don’t stay quiet for too long. As (bad) luck would have it, Harry’s quiet village is soon the setting of a host of grisly murders, in which the victims are butchered with a big sickle. They don’t do things by half measures in Norfolk, you see. The villagers think the killings are the work of the White Lady of Rayleton, the ghostly local legend. 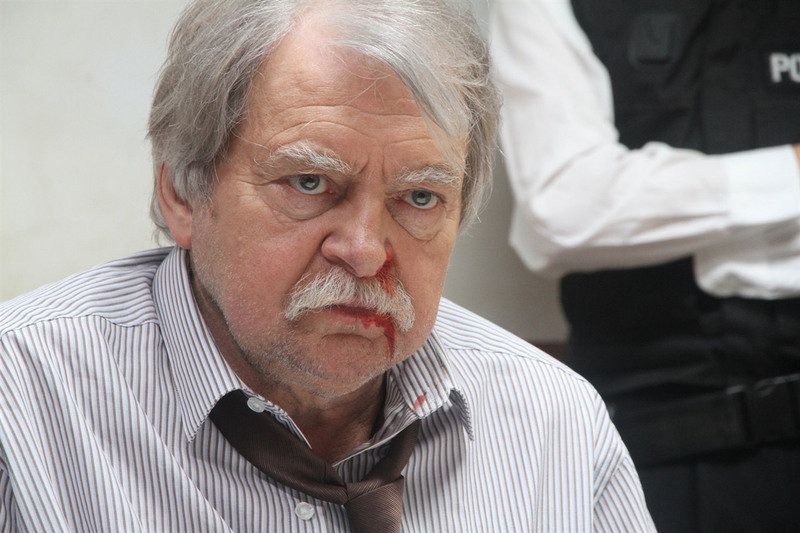 The police aren’t too convinced, especially Detective Inspector Bracken, who dealt with Harry back in the day and is convinced he’s getting straight back into the killing habit again. There’s a twist, though. Harry’s got psychic powers, which he’s been trying to suppress over the years by drinking them away. These powers might be able to help Harry figure out what’s going on and not only clear his name, but also patch things up with his estranged wife (who’s now in a nearby madhouse). Evil Never Dies has some decent performances, but British audiences will be forgiven for thinking they’ve stumbled on an odd paranormal episode of The Bill. Tony Scannell, who plays Harry, starred in the long-running ITV series for nine years as D.S. Ted Roach. Meanwhile, Graham Cole, who here plays the role of Harry’s rival Detective Inspector Bracken, was PC Stamp on the same show for 22 years. Meanwhile, the role of Harry’s wife is filled by Katy Manning – who appeared in Doctor Who back in the 1970s as the third Doctor’s assistant Jo Grant – and Harry’s old gang boss is played by the wonderfully-named PH Moriarty, who was Hatchet Harry in Lock, Stock And Two Smoking Barrels. So there’s some experience here. It’s a shame, then, that Evil Never Dies doesn’t really manage to elevate itself above normality despite its relatively unique concept. The story is fairly basic, with about as many layers as a t-shirt, while all the apparently gruesome killings were seemingly deemed too brutal (or, more likely, too expensive) to show on-screen. In fact, it’s telling that despite the film being mainly about Harry’s psychic battle with the village’s ghosts, the majority of the most engaging scenes are the flashback sequences in which there’s nothing paranormal to be seen and everything just feels like a straight-up gangster flick. The only major success is the film’s twist ending, which is fairly clever to a point, until the film decides it can’t be happy enough with a nifty sucker punch and goes one step further with a silly battle involving people’s souls. If you see Evil Never Dies fairly cheaply then it’s probably worth a watch, because there’s some solid acting on display here and it’s an interesting premise. But don’t expect to be running around and telling your friends about this hidden gem you’ve just found, because there’s really nothing remarkable about it. 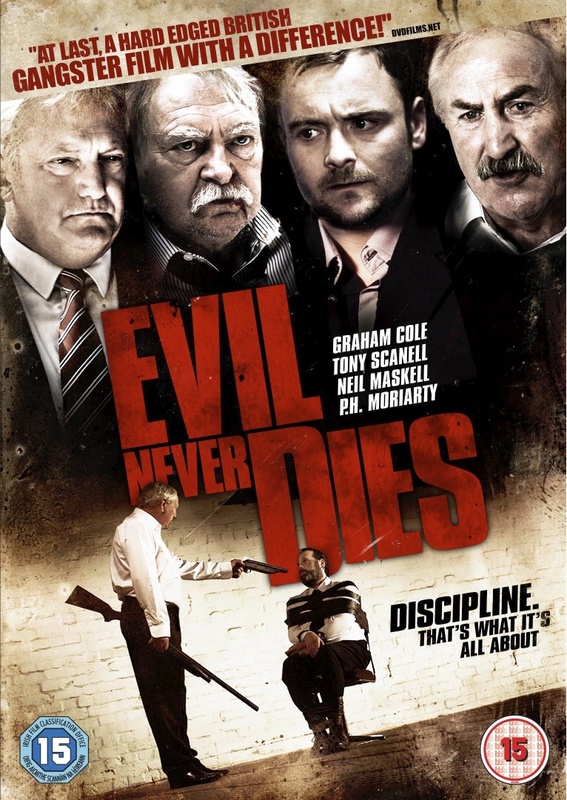 Evil Never Dies was recently released on DVD in the UK courtesy of 4Digital Media. You can get it here. It isn’t available in the US yet.